The Howard Lewis Family accepted the Award for the USHJA Zone 5 Horseman of the Year presented by Diane Carney, Kevin Price and Emma Nichols of USHJA. Photo by Chicago Equestrian. 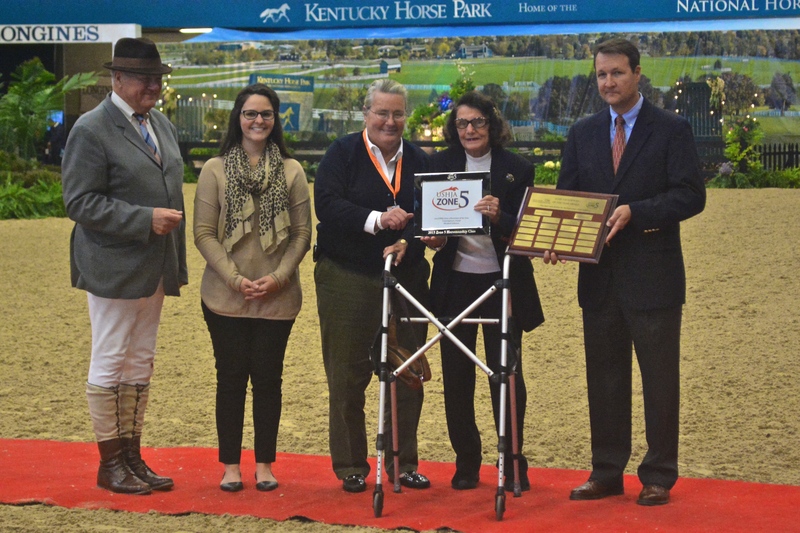 Lexington, KY – October 30, 2015 – The USHJA Zone 5 Horseman of the Year Award was presented at the CP National Horse Show to the Howard Lewis family and Elizabeth Johnson. The award was established in 2014 and is presented to individuals, who through their dedication and contribution of time, knowledge, financial and other assistance, have added to the betterment of the sport. The award has two categories: contemporary and posthumous. Those eligible to receive the honor include individuals, groups of horsemen, riders, owners, and breeders who are residents of Zone 5. The USHJA Zone 5 Hunter and Jumper Committees are pleased to announce Elizabeth Johnson as the Contemporary Award winner and Howard Lewis as the Posthumous Award winner of the 2015 USHJA Zone 5 Horseman of the Year Awards. Hailing from Gates Mills, OH, longtime professional horsemen Howard Lewis excelled in the show world as a top Open Jumper, renowned trainer and respected judge. As a rider, he was tough to beat in show rings of the 1930s through the ‘50s, competing against fellow legends such as Cappy Smith and Max Bonham. As a trainer who turned horses into winners and riders into champions, he was known for his kind hand with horses and gentle nature with students. Additionally, Mr. Lewis judged some of the country’s most prestigious competitions including Upperville, Harrisburg, Madison Square Garden, Washington, and Devon. His sense of community was also displayed through his volunteer work at what is now USEF as a member of the Junior Committee and Board of Directors. Named 1995 Tri-State Trainer of the Year, 1996 Professional Horseman’s Association’s Horseman of the Year, 1997 American Horse Shows Association’s Horseman of the Year, 2000 National Show Hunter Hall of Famer, 2001 WCHR Lifetime Achievement Winner, AHSA Horseman of the Year, Manager of the prestigious Chagrin Valley Hunt Club, Vice President of the Horsemen’s Association of America, USA Equestrian Honor Roll of Distinguished Officials, and one of the founders of the Ohio Professional Horseman’s Association – Howard Lewis’s impressive list of accomplishments are what legends are made of. Accepting the award on his behalf is the family of Mr. Howard Lewis; his son, Jerry; daughter, Sharon Lewis Alison; his daughter-in-law, Betsy Lewis; and his grand daughters, Brittany Lewis Anderson and Cody Lewis Shulte. Elizabeth Johnson accepts the award for USHJA Zone 5 Horseman of the Year. Photo Chicago Equestrian. A resident of Zionsville, IN, Elizabeth Johnson has owned and shown some of the sport’s most famous hunters. She was a competitive Amateur Owner rider at top U.S. shows in the 1940s through the 1980s. Her horses include the legendary Eastern Shore, Super Flash, Fun and Games, and Early Light among many other beloved champions. Mrs. Johnson joined the Traders Point Hunt Club in 1947, later becoming a Board Member and Master of Foxhounds. She showed her Hunt horses in the “Traders Point Hunter Trials” for many years, retiring several beautiful trophies. In 1996, Mrs. Johnson was honored at the National Horse Show at the Madison Square Garden as a Living Legend, having won championships there both as a rider and as an owner, including the “Hunt Team Class” with Wilson Dennehy and George Clarkson. Additionally, Mrs. Johnson acts as the guiding light behind the Traders Point Hunt Charity Horse Show, held for 37 years on the grounds of her own Wild Air Farms in Zionsville, IN. The show has benefitted many charities, including the Breast Health Awareness League, Humane Society, Little Red Door cancer patients, Morning Dove therapeutic horseback riding, and the Riley Hospital for Children. She is a life member of American Horse Shows Association and the Foxhound Club of North America, and has served as a Board Member of the Master of Foxhounds Association of North America. In recognition of her many Championship wins and accomplishments, she was inducted into the National Show Hunter Hall of Fame of the National Hunter Jumper Association in 2015. Diane Carney, the Zone 5 Jumper Committee Chair, presented the award along with Kevin Price, the USHJA Executive Director and Emma Nichols, the USHJA Awards Assistant. “We are grateful to the CP National Horse Show for allowing us the opportunity to present this prestigious award to many generations of great horseman in our industry. If you don’t know who these people are you need to google them and find out. Both award winners have launched the career of many horses and professionals active in the industry today,” stated Diane Carney. The late Mindy Darst was awarded the Posthumous Award in 2014 and The Kentucky Horse Park Foundation was awarded the Contemporary Award.